He has worked for Walt as well as for Pixar’s John Lasseter. They could both identify when something wasn’t working, and everyone who worked for either man was eager to please them. Walt was difficult to please, and whenever he was around, the code among the staff to let each other know was “man is in the forest” (from Bambi). Floyd worked lots of all-nighters at Pixar, but he said that John Lassiter is less terrifying than Walt “because I regard Lasseter as a kid.” Steve Jobs personally thanked Floyd for the work he did on Toy Story. Floyd was walking on air for the rest of the day. And, on broadening one’s skills: “It’s very important to learn everything. If you want to be an artist, study dance, study literature, be a poet, travel, get to know other cultures, get out of your safe zone, take some risks.” Being able to read music meant he could read a score when he was working with a composer in a Disney recording studio. 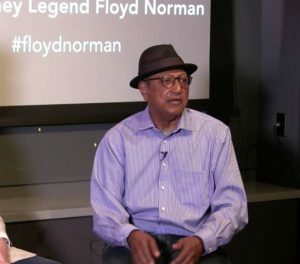 A documentary of Floyd’s life has been released on Blu-Ray and is available at “http://floydnormanmovie.com/“. He didn’t mention it during the interview, and I haven’t seen it yet, but I’m linking it here because he’s fascinating speaker with a great background. This entry was posted in Disney, Writing. Bookmark the permalink. Sounds like the PERFECT kind of interview and information you could use for inspiration and guidance for your writing. Even with your paraphrasing of his responses I wished I was there to soak in his knowledge.